We provide two tours daily beginning Mid-May until freeze-up, usually first weekend of September (tour times are below). We operate in all weather conditions, very rarely do we close because of weather (i.e. rain), if you’ve made the trip, we’ll still make it worthwhile. To see our gold mining operation requires a trip into the traditional goldfields of the Klondike, our staging area is at the former town site of Goldbottom, a once thriving, sociable community that boasted a population of close to 5000 people during the hey-days of the 1898 Klondike Gold Rush. We provide escorted tours of our family’s authentic gold mining operation on Goldbottom or Hunker Creek in the Heart of the Klondike! We give explanations and demonstrations of historic and modern placer gold mining methods and processes, everything from staking a claim to selling the gold. We share personal experiences and stories about life on the creeks. 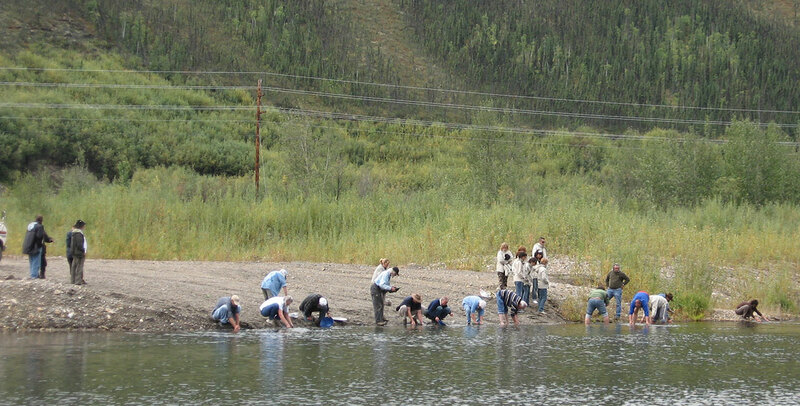 The Millar Family and our Goldbottom Crew has over thirty years gold mining experiences to share. Please note: The tour is mostly conducted outside, above ground and guests should dress appropriately for the weather. Sturdy footwear is recommended as standing and walking on rough gravel will be required. Bring dry clothes for the kids, and bring insect repellent (or you can use some of ours by donation). Kids and pets are welcome! Includes transportation from our booth on Front Street in Dawson City and expands on our usual Goldbottom Mine Tour to provide the MOST comprehensive Klondike Gold Rush experience available in Dawson City. Make your own way to Goldbottom townsite. Adults – over 15 years of age | Youths – 7 to 15 years of age | Children under 7 are FREE! So sorry, but please add 5% gst tax to all prices, including any “deals”. We provide 7 tours daily every hour on the hour from 10 am till 4 pm, beginning mid-May and going until mid-September. Each tour takes approximately 1 hour. Dredge No. 4 is a designated Canadian National Historic Site and reflects the evolution of gold mining in the Klondike and the development of the industrial mining age. Built by The Canadian Klondike Mining Company in 1912/1913, Dredge No. 4 was the largest wooden hulled dredge in North America at the time. Dredge No. 4 operated in the Klondike for approximately 40 years before stopping permanently on November 1, 1959 in its current resting place. Dredge No. 4 is located 15 km down Bonanza Creek road; please note it is cash only at the dredge, or you may purchase your tickets in advance at our ticket booth in Dawson. If you would like a ride out, please contact us in advance. We can provide transport for a minimum of 2 people.